According to the RTP WhitePaper Integrating Mobile Across All Touch Points, Smartphones will Influence $689 billion in Retail Store sales by 2016. They currently influence approximately $159 billion in total sales revenue and with 100s of billions of dollars at stake the inconvenient truth is that retailers need to contend with shopper behavior changes and the challenges of this new dynamic environment. 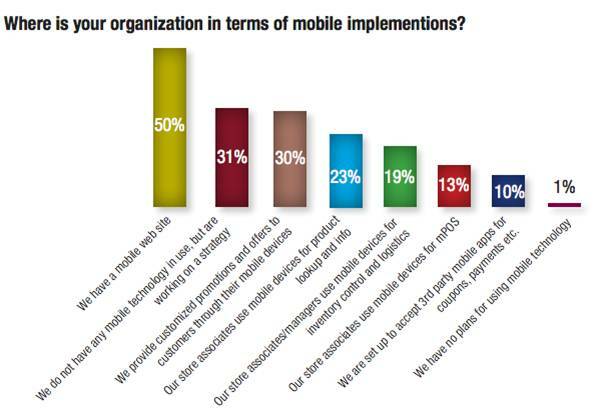 Not to mention, mobile marketers have yet to unilaterally codify benchmarks for success. As shown in the below chart, only 50% of the brands polled have mobile web sites, less than a third use mobile technology currently and less than a third leverage mobile for customized promotions/offers through customers’ devices; the quintessential example of MISSED OPPORTUNITY. Overlooking mobile as a means to engage with customers is a travesty and could be the catalyst in the demise of a retailer or brand. When asking consumers about their most recent shopping trip, Deloitte found that 72% of smartphone owners indicated they made a purchase on that day, compared with 63% of shoppers who did not tap into their devices within the same period. The moral is smartphone-toting consumers appear more likely to make a purchase than those who do not own one or do not use it to assist with in-store shopping. We have entered into a brave new digital world where contextual content can be experienced, any time, any place—creating more opportunities than ever before for marketers to reach, engage and measure consumers. Sophisticated shoppers respond to the “pull” advertising model whereby consumers request product info and pull it through the delivery channel. The use of the word “pull” is to describe the consumer that is raising their hand and asking, you the retailer, or the brand to engage. They want to be talked to, they want you to send them something, they want you to share. However, campaign execution can become a bit dicey since personalization and relevance tend to be main drivers for incentivizing a consumer’s engagement. The frame-work for building a successful “pull” oriented program begins with knowing the breakdown of the demographic profile being targeted. Age, gender, income level, location, region, country, etc. are paramount and vital to delivering the right piece of information to the right individual. Using business intelligence to guide marketing decisions will enable retailers and brands to respond to these hand raisers. The ScanLife platform captures vital metadata such as Handset OS, Location and Demographics via smart code technology. Easily enabling retailers and marketers to deliver contextual and personalized experiences based on parameters such as language setting of device, time of scan, location, etc.